This article helps to add to the knowledge acquired from the article, Chronic Kidney Disease and Potassium — A Guide for the CKD Patient. For the most accurate measure of potassium amounts in food or to identify if potassium has been added to a food product, it requires knowledge of how to read and understand the nutrition facts label and ingredient list. The U.S. Food and Drug Administration (FDA) requires a Nutrition Facts Label on most packaged foods and beverages. The label has recently been revised and updated. Some food manufacturers have already started using them on their products; however, they are not required by the U.S. FDA to use them on packaging until January 2020. Starting in 2017, The Canadian Food Inspection Agency (CFIA) started requiring food manufacturers to replace existing food labels with newly revised and updated ones. They must be updated by 2021. 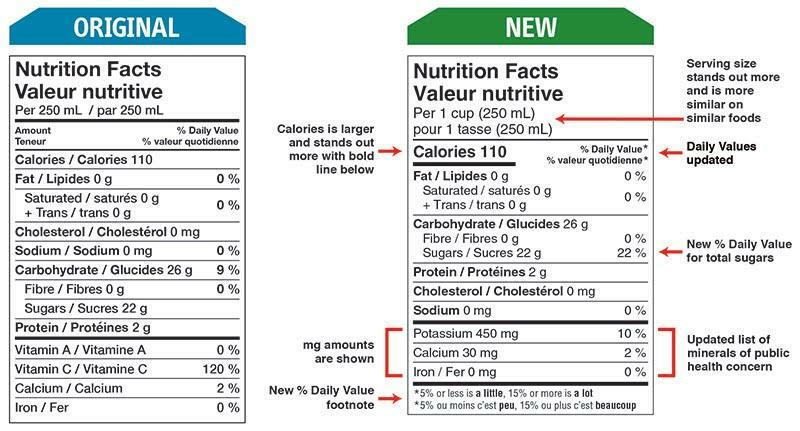 Several changes have been made to the food label for both the US and Canada. One, specifically, is very important for individuals with Chronic Kidney Disease (CKD). With the revisions, both the U.S. and the Canadian food labels will add the milligrams and % Daily Value (DV) per serving for potassium. This will help CKD patients identify how much potassium is in a serving of a particular food product. Additionally, it helps individuals make more educated and better food choices based on individualized potassium needs and restrictions. It’s important to understand the amounts of any nutrients listed on the food label are for ONE serving of that food. Using the “New Label” above, this food item has 235mg of potassium in ONE, 2/3 cup serving of this food. Beware — most cans, bags, or packages most likely contain more than one serving. So, if you eat two, 2/3 cup servings of this food it will provide you with 470 mg of potassium. The recommended DV for potassium for individuals with healthy, functional kidneys is 4700 mg per day. On the food label, the % DV that each serving of food meets is based on the recommended daily intake for potassium for healthy individuals of 4,700 mg. For example, using the “New Label” above, a 2/3 cup serving of this food will meet 6% DV of an individual’s 4700 mg potassium need for the day. For individuals with CKD, daily potassium requirements vary depending on the stage of CKD and blood potassium levels. This will change the percent daily value it will meet due to individual needs and require you to do a little math. For instance, if your individual daily potassium limits are 2000 mg per day, then one, 2/3 cup serving of this food will meet 12% DV (still 235 mg) of your total 2000 mg potassium need for the day. If you need to restrict your daily potassium intake, stick to choosing foods considered “low in potassium” and occasionally select foods “medium in potassium”. Limit or avoid eating “high in potassium” foods. Keep in mind these potassium guidelines when choosing foods. 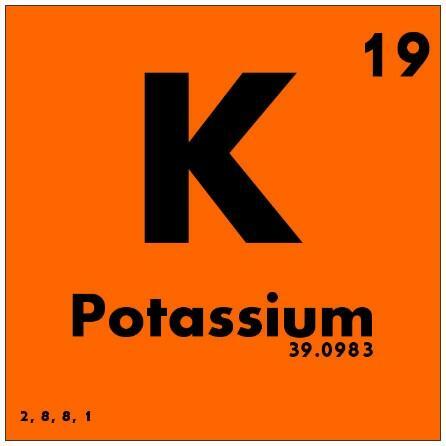 Another tool to identify if potassium has been added to a food product is the ingredient list. Potassium is added to many processed foods to help maintain or improve safety and freshness, improve or maintain nutritional value, and/or improve taste, texture, and appearance. The ingredient list shows all the ingredients in a packaged food. Ingredients are listed in order of quantity/weight, beginning with the ingredient that weighs the most and ending with the ingredient that weighs the least. This means that the food contains more of the ingredients found at the beginning of the list and less of the ingredients at the end of the list. For example, on the following ingredient list, “corn” is the predominant ingredient in this food and “vitamins” are the least. Look for these words on ingredient lists to see if potassium was added. Use these tools to be a vigilant label reader! Knowledge is the key to avoiding excessive potassium in the diet and finding new, low-potassium secret weapons to keep your blood potassium levels controlled. Good control may help slow the progression of CKD or help prevent medical issues.